Alcohol consumption in prolonged starvation (approximately 2 days) can lead to severe hypoglycemia (<50 mg/dL of blood glucose concentration) which in turn can lead to severe irreversible damage primarly of the nervous tissue especially of the brain as the latter meets its metabolic demands almost exclusively with glucose. In addition hypoglycemia affects the erythrocytes as they use glucose as their only energy source. Alcohol, more specifically ethanol (also called ethyl alcohol), is metabolized in the hepatic cell through a very complex metabolic pathway. 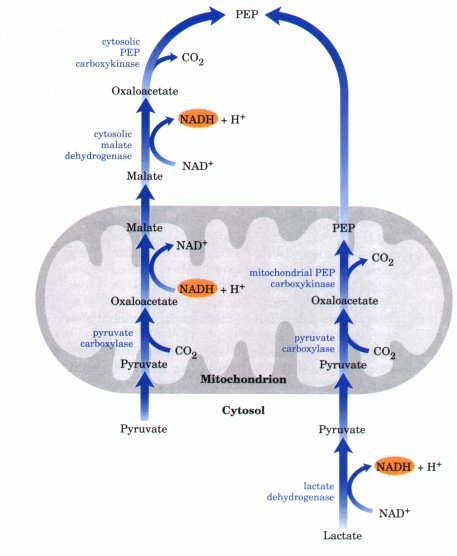 The important feature in this metabolic step is the key role of the NAD+ molecule. The enzyme alcohol dehydrogenase (ADH) performs the oxidation of ethanol via the reduction of the NAD+ molecule which is in its oxidative form transforming it to its reductive form which is the NADH molecule. Thus, in this operation, the conversion of ethanol to acetaldehyde leads to the increase of the concentration of NADH and as a consequence the [NAD+]/[NADH] ratio in the cytosol of cells, which is the major regulatory mechanism, decreases. In the second step acetaldehyde is oxidized to acetic acid by the cytosolic or mitochondrial hepatic enzyme aldehyde dehydrogenase 2 (EC number 1.2.1.3) according to the second part of the scheme above. Again the enzyme acetaldehyde dehydrogenase (ALDH2) performs the oxidation of acetaldehyde via the reduction of the NAD+, which leads to an ulterior increase of the NADH concentration and a decrease of the [NAD+]/[NADH] ratio. In the last step acetic acid is converted to acetyl-CoA by two enzymes. The first is the acetyl-CoA synthase 1 and the second the acetyl-CoA synthase 2 according to the last part of the scheme above. 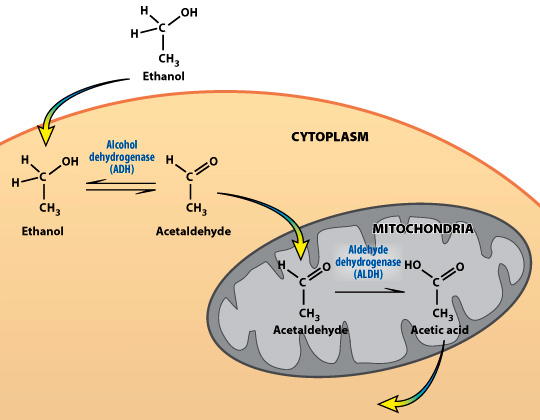 It is important to note that the oxidation of ethanol to acetaldehyde occurs primarly in the cytosol of the liver cell but alternative pathways also exist as shown below. In non chronic alcoholic individuals the cytosolic pathway is mainly prefered. Other pathways include the microsomal and the peroxisomal. In the microsomal, the so-called MEOS pathway, the oxidation of ethanol to acetaldehyde occurs via the enzyme P4502E1 and in the peroxisomal via the enzyme catalase. In chronic alcoholic individuals the MEOS pathway is prefered. The oxidation of ethanol to acetaldehyde is achieved via the oxidation of the NADPH molecule instead of the reduction of the NAD+ molecule. The excess NADH slows the TCA cycle (tricarboxylic acid cycle) and the built-up of acetyl-CoA stimulates gluconeogenesis. Gluconeogenesis is the anabolic pathway of the biosynthesis of glucose from pyruvate. It is the opposite procedure of glycolysis. pyruvate enter the mitochondrium, pyruvate carboxylase converts it to oxalacetate, mitochondrial malate dehydrogenase converts oxalacetate to malate, malate exit the mitochondrium, cytosolic malate dehydrogenase converts it to oxalacetate and finally cytosolic PEP carboxykinase converts it to PEP (phosphoenolpyruvate). The important feature is again the NAD+ molecule which is indispensable for the conversion of malate to oxalacetate in the cytosol of the hepatic cell as it is reduced to NADH. lactate is converted to pyruvate via the enzyme lactate dehydrogenase, pyruvate enter the mitochondrium, pyruvate carboxylase converts it to oxalacetate and then mitochondrial PEP carboxykinase converts oxalacetate directly to PEP and PEP exits the mitochondrium. The important feature is again the NAD+ molecule which is indispensable for the conversion of lactate to pyruvate in the cytosol of the hepatic cell as it is reduced to NADH. NAD+ is the key feature because it is indispensable either in the alcohol metabolism (via ADH and ALDH2) or the first steps of gluconeogenesis. As ethanol is a toxic substance for the human organism, its metabolism prevail respect to gluconeogenesis. Thus, the availability of NAD+ for gluconeogenesis decreases. In 12 to 24 hours of a fasting state, glucose sources such as glycogenolysis are depleted and the only way to keep the blood glucose levels at their physiologic values (approximately 100mg/dL) is gluconeogenesis. As gluconeogenesis is inhibited, blood glucose levels decrease leading to hypoglycemia. Alcohol consumption along with starvation leads definitely to the inhibition of the gluconeogenic pathway which in turn leads to a severe hypoglycemia. 5. David L. Nelson, Michael M. Cox (April 23, 2004). "Gluconeogenesis". Lehninger Principles of Biochemistry (4th ed.). New York: W.H. Freeman and Company. p. 543-549. ISBN 0-7167-4339-2.